We’re suppose to visit Hangzhou on day 2 but decided to change to day 3 because we’re worry we won’t be able to recover from our zombie mode! 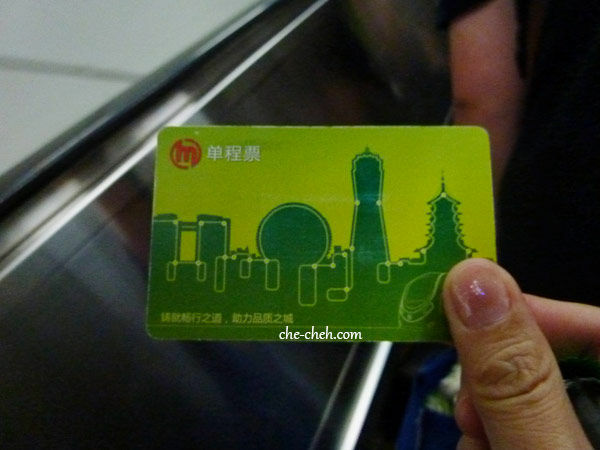 Haha Traveling to Shanghai Hongqiao Railway Station is very easy. 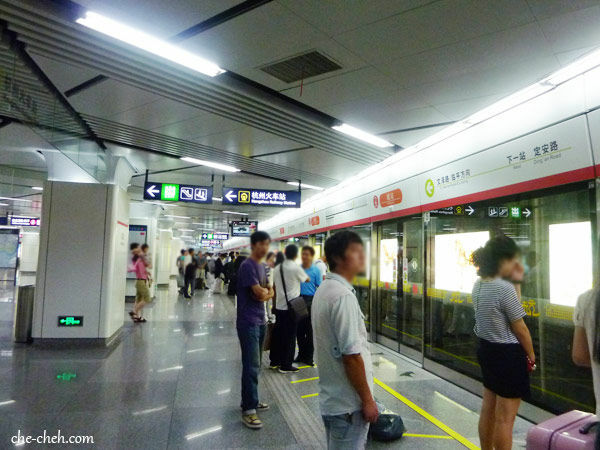 All we need is take the metro from East Nanjing Road for 35 minutes. While we’re trying to figure out how to buy tickets at the lower level of the railway station, we were confronted by several touts and got swayed away for a moment. They told us earlier tickets were all sold out, the latest tickets availability are from noon onwards and so asked us to buy from them and follow their tour. But I figured this can’t be true. 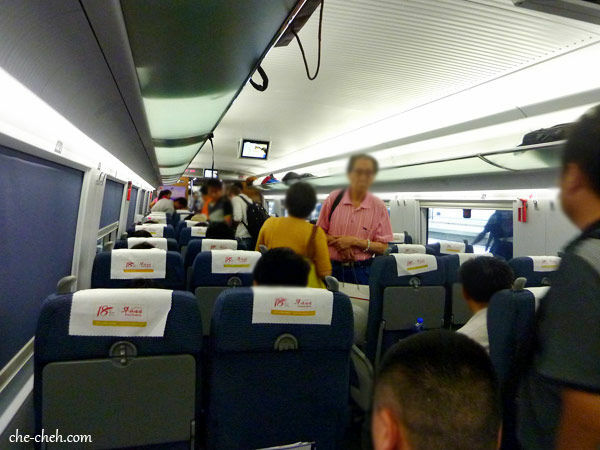 There are lots of train to Hangzhou daily plus it’s not holiday season, impossible for the early tickets to be sold out. So we told them off HUNDRED OF TIMES and got back in line. We were able to buy tickets that depart an hour from now. Bear in mind, you need to show your passport while purchasing the train ticket. Fyi, we also bought return tickets as well. 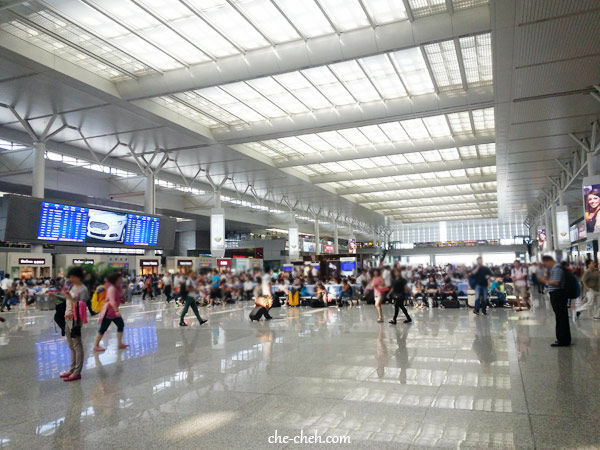 We then proceed to Level 2, the departure hall. We found out there are ticket counters on this level as well. 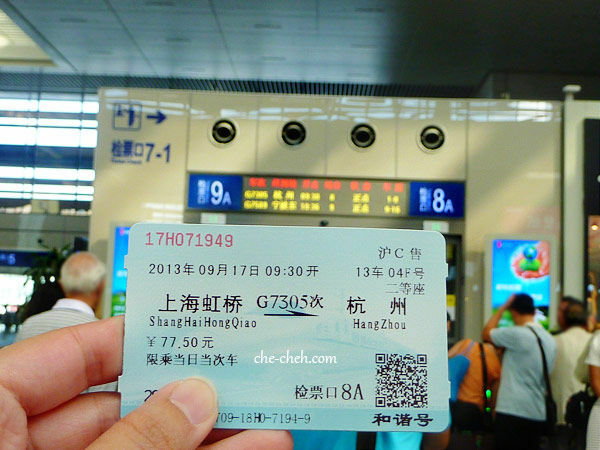 Our train ticket @ 77.50 Yuan/pax/single trip to Hangzhou at 9.30am via G train which is a fast bullet train that can reach over 350km/h. On the background is our boarding area. 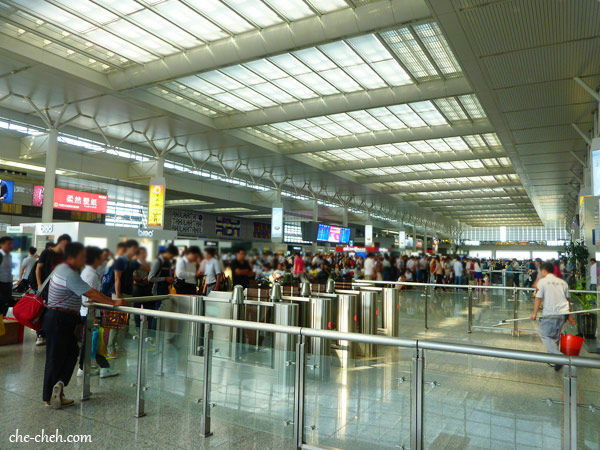 I can’t imagine how Shanghai Hongqiao Railway Station will look like during holiday period. Gotta say this departure hall (level 2) is very pretty. Inside our bullet train. 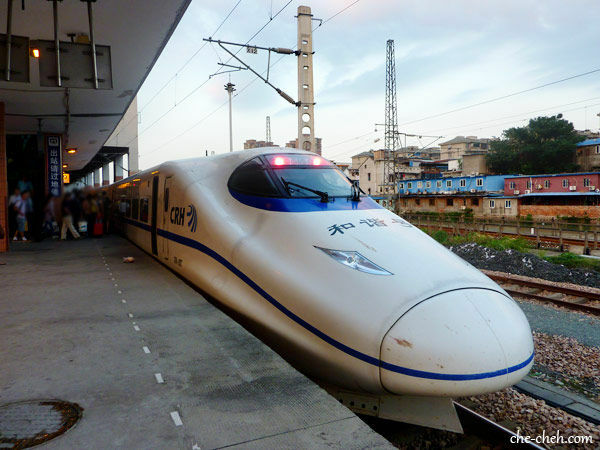 In China, they’re called high-speed train. It’s a 2-3 seating which suit us perfectly since there are 5 of us. 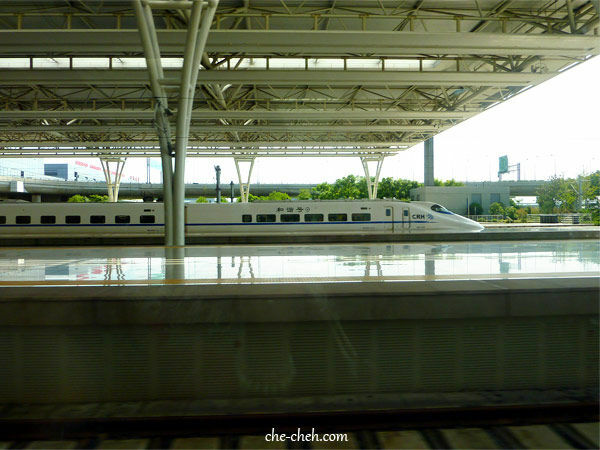 One of the high-speed train in Shanghai Hongqiao Railway Station. Leaving Shanghai Hongqiao Railway Station right on the dot. 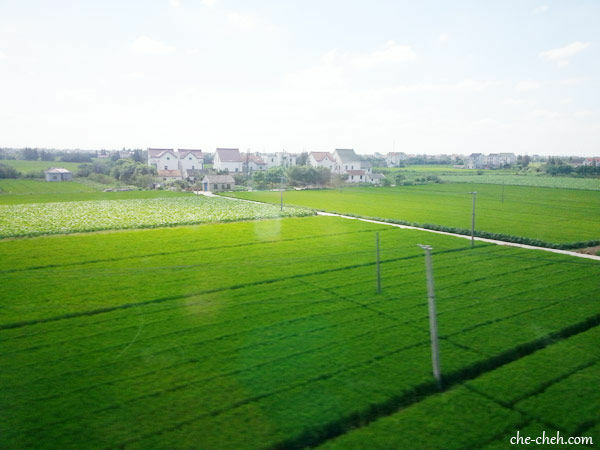 Train ride to Hangzhou. 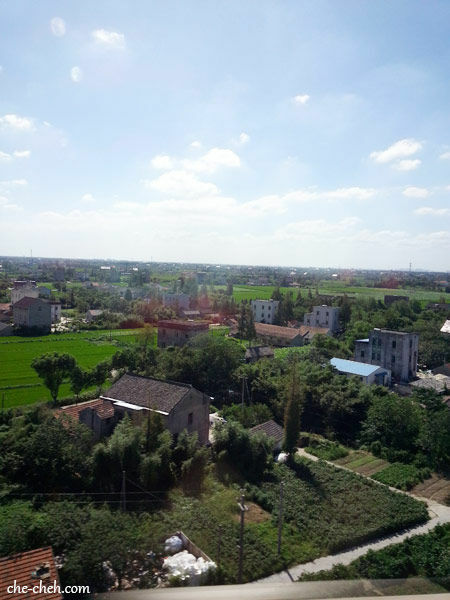 The train stopped at several stations on the way to Hangzhou. Houses which look abit like European style. 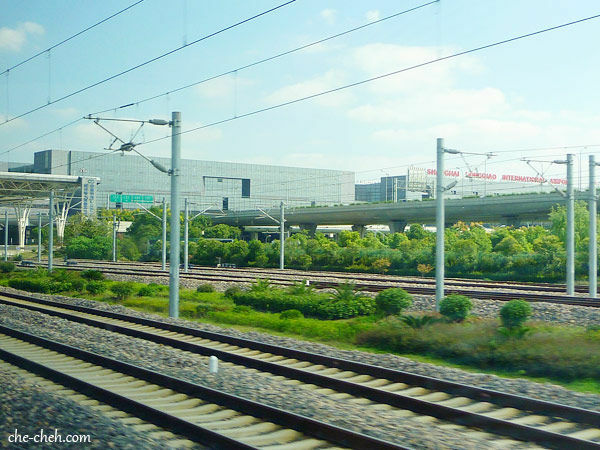 Once reached Hangzhou Railway Station, we proceed to the next building for metro. 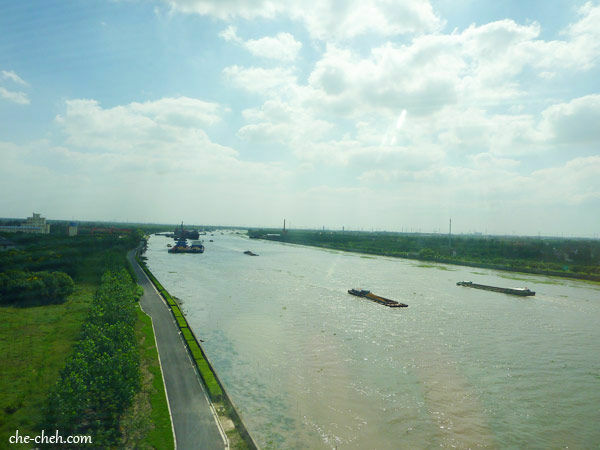 Our destination is Longxiang Bridge stop. 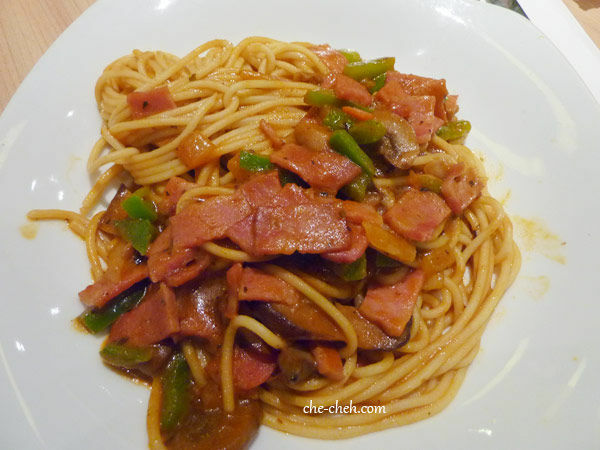 Had the most creative lunch there… bacon spaghetti, pizza and fried bacon rice at Pizza Hut. 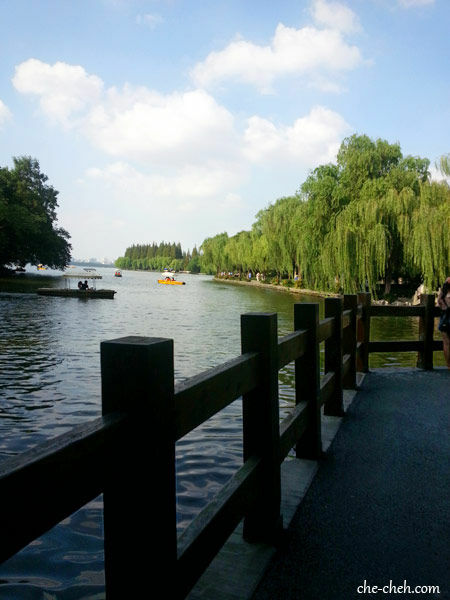 LOL We also did a little shopping at Gap before proceeding to West Lake which is just a short walk away from the metro. The first thing we saw was people riding tandem bicycles. Not thinking of the cause and effect, we all agreed to go around the lake in tandem bike. 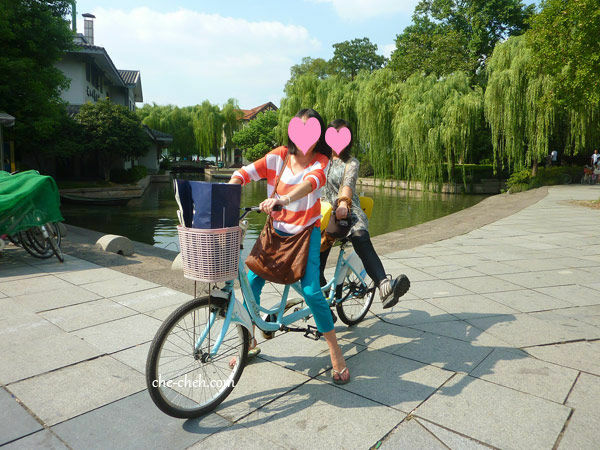 For 5 person renting 2 tandem bikes for 2 hours cost 100 Yuan (after bargaining with them) with 200 Yuan deposit. This is me and sis in twin bike while my 3 friends took the 3 seating one. Well, it was HORROR from the start. I knew how to cycle but not my sis. Somehow I have a very difficult time balancing the bicycle. My friends too! In addition to that, we have cars, other bicycles, buggies and people walking to take care off. We were so noisy. What got my balancing act together was when my sis kept telling me “Balance, balance… yeah you can do it”. HAHAHA In the end, we all only lasted for 1/2 hour. LOL LOL LOL But it was pure bliss, fun and joy… and tiredness. Ha! 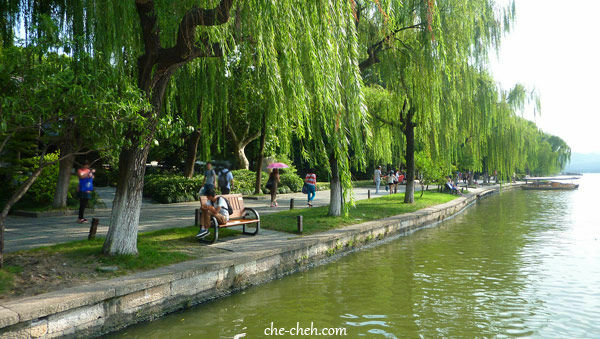 Many willow trees line up along the lake. 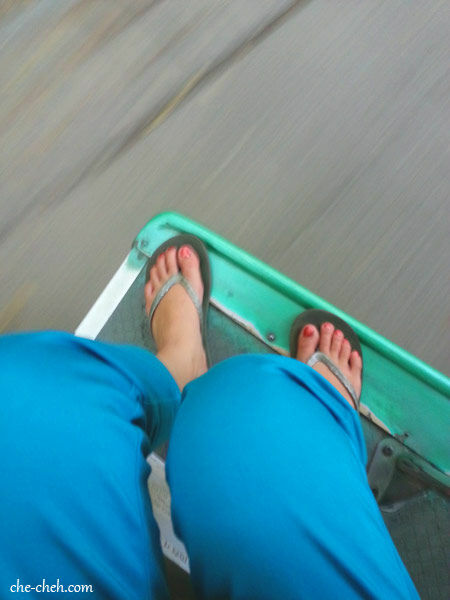 After surrendering the tandem bikes, we choose this buggy as the mode of transportation. 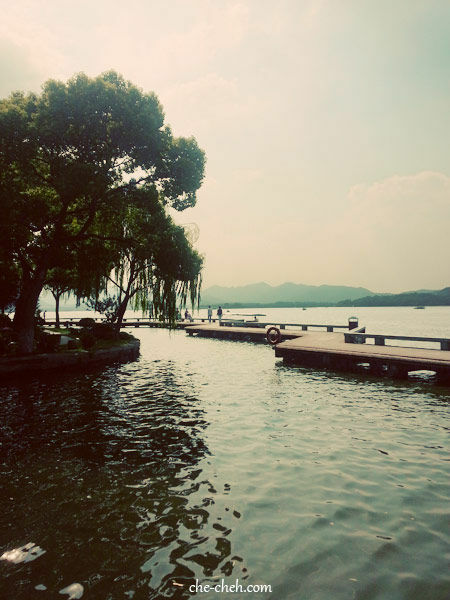 We realized West Lake is just too large to walk. This is the best choice. 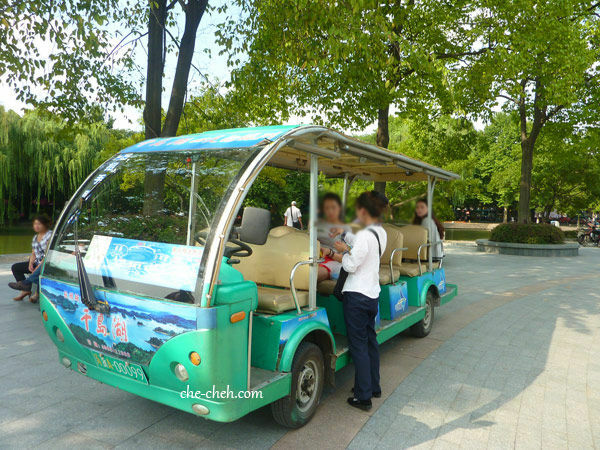 The buggy will stop at several attractions along the way, so you need to inform the driver where you want to go. 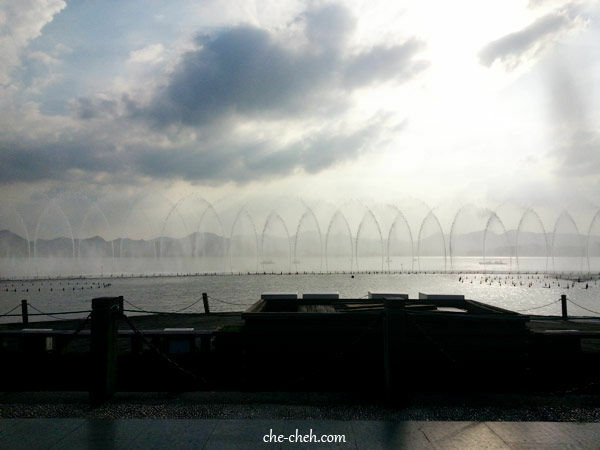 We made 2 stops at first which cost 10 Yuan per pax. 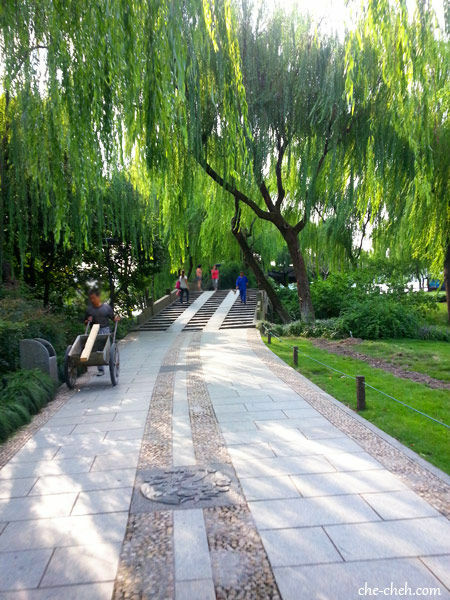 Later we took the remaining distance all the way to our starting point which cost 40 Yuan per pax. So total is 60 Yuan per pax. 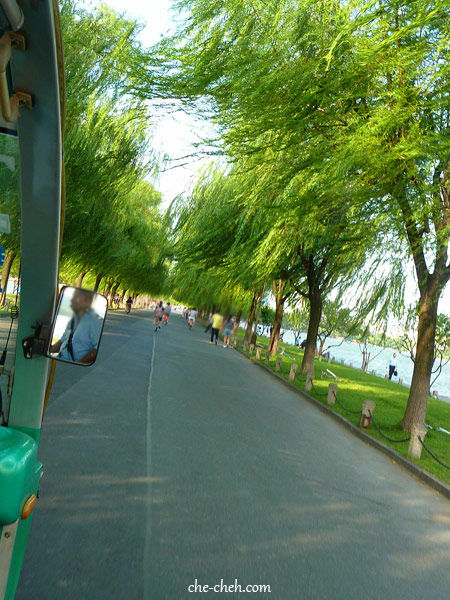 If we go the round trip without stopping (about an hour ride), the cost is 40 Yuan per pax only. 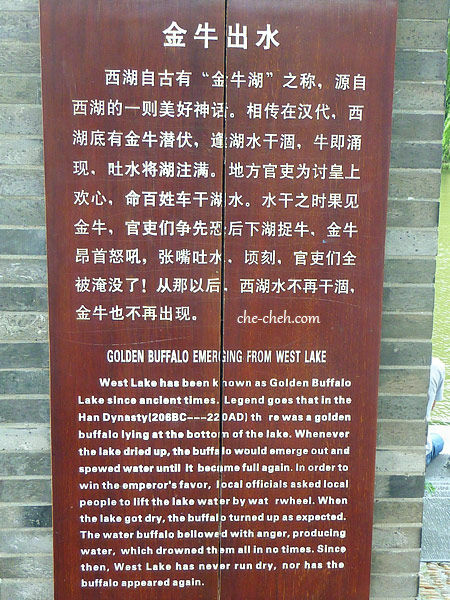 Golden buffalo of West Lake. Read this and you’ll know the story of the golden buffalo. 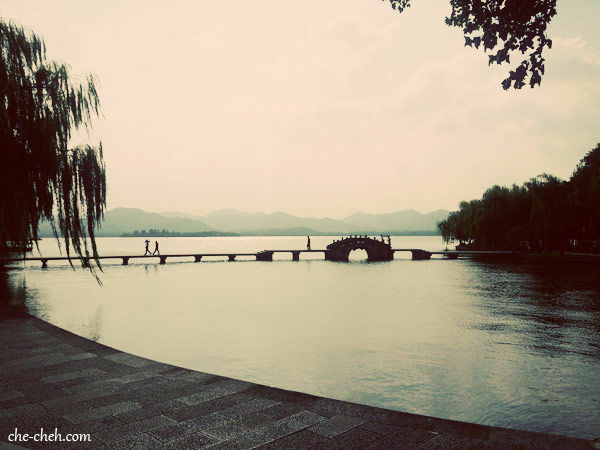 West Lake… ahh Can you spot me there? 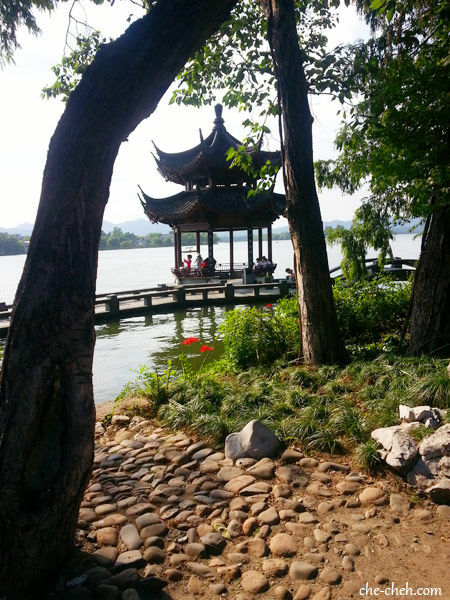 Pavilion at West Lake. Ahh if only we have time, I would love to sit there and enjoy the view. 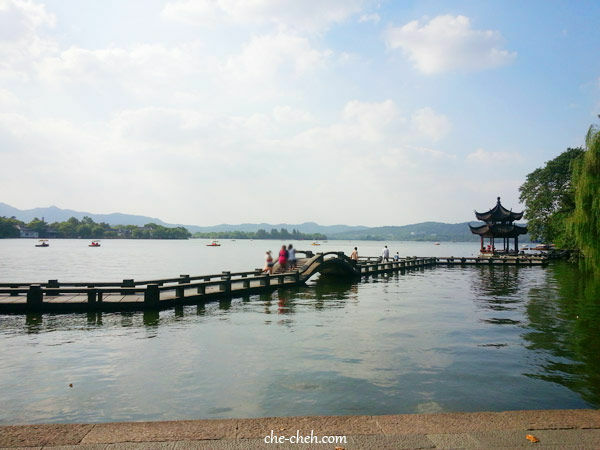 West Lake with Lei Feng Pagoda at the far left. 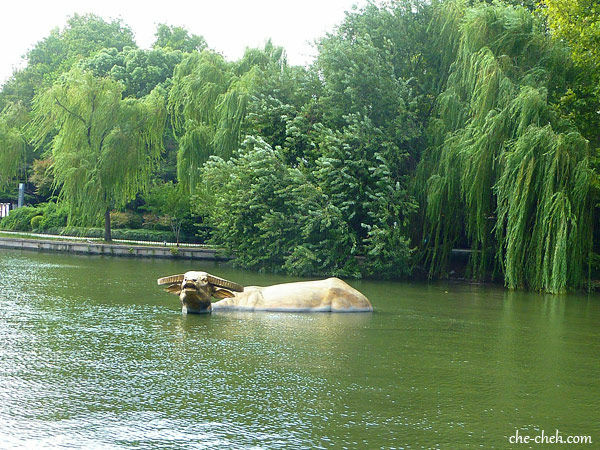 Like a scene from period Chinese dramas. 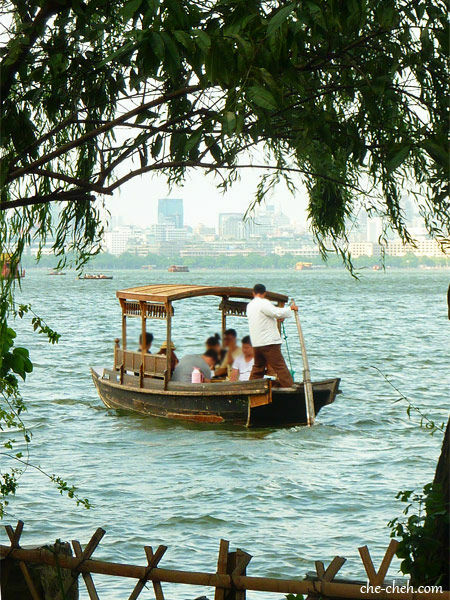 There are many types of boats to ride on West Lake. This is one of them. Riding dangerously… NOT. I think the best buggy seat is the one at the back. There’s nothing to obstruct your view. Lei Feng Pagoda. Just look-see from here. 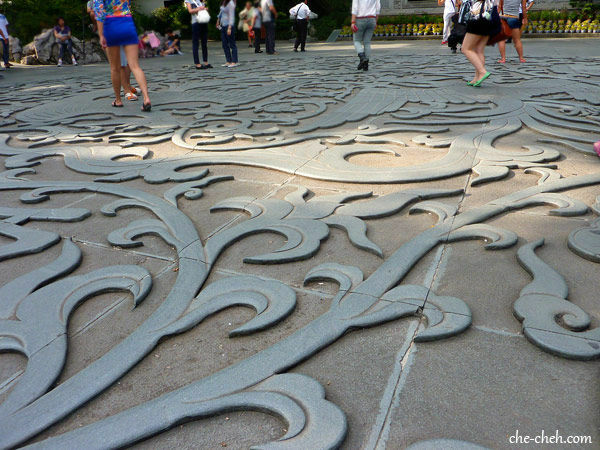 Beautiful carved stones at Lei Feng Pagoda. 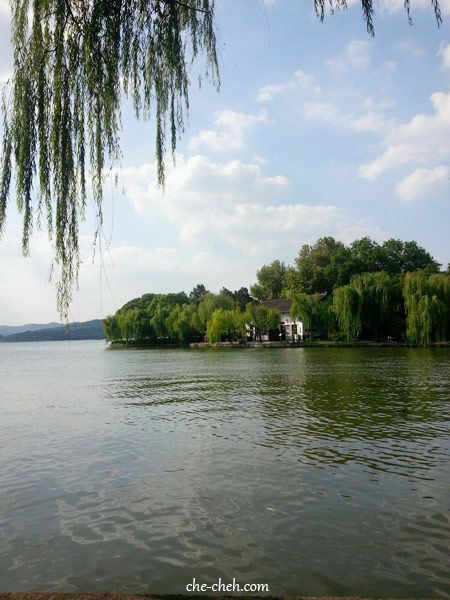 Typical view of West Lake. At one point it was so windy that I pity those on the lake. There’s no life-jacket! 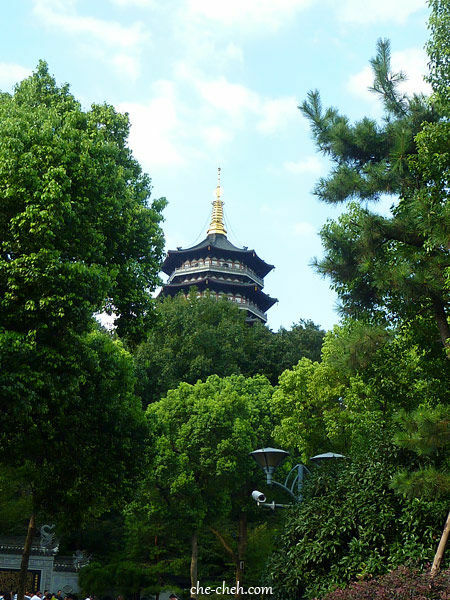 Lei Feng Pagoda from a distance. If you’re there at the right time, you could see blooming lotus flowers. At Bai Causeway if I’m not mistaken. 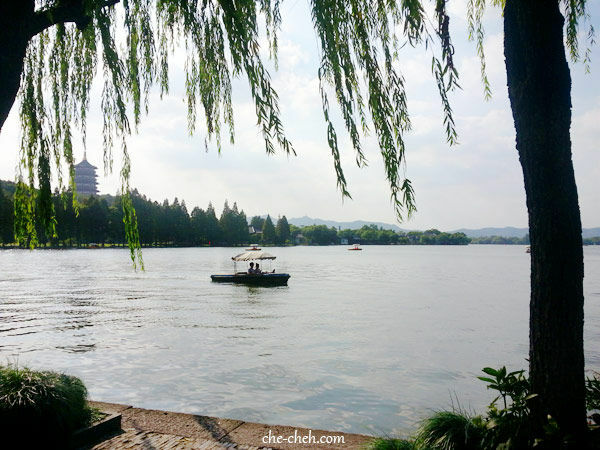 And an awesome view to end our West Lake visit. 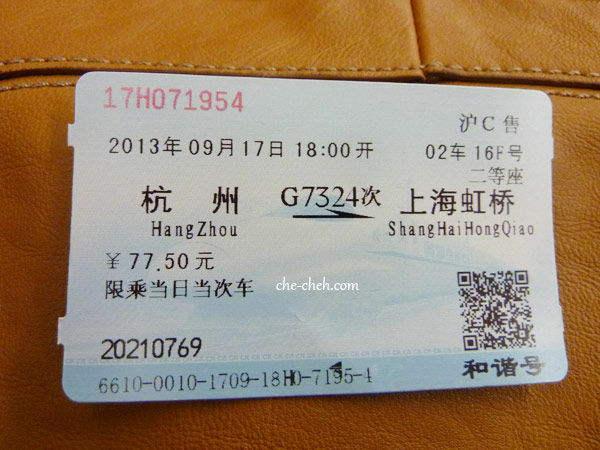 Train ticket back to Shanghai. Our ride back to Shanghai. Lucky ours are coach no. 2 only. So no need to walk so far. oh..just day trip ar..nothing else to visit there? This looks like a very nice place. Think I read from Jam’s blog too last time. 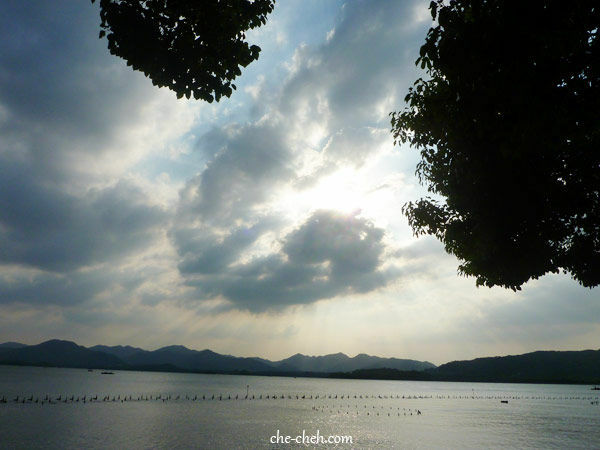 Love your photos and those awesome sceneries of the lake and the surroundings! I think I will surely love it!